Soul Winning is starting a conversation with an unsaved person and sharing God’s plan of salvation with them from the Bible, so that they clearly understand how they may receive Christ as their Saviour and have eternal life. It is leading a person to Christ. On Saturday afternoons at 2.30 pm we meet outside Merrylands main shopping centre to pass out Gospel tracts and share the Gospel with any passers-by who are willing to stop and speak with us. 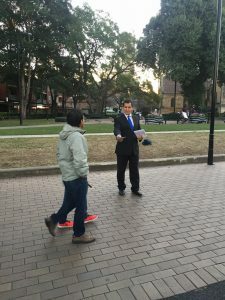 Also on Sunday afternoons at 4 pm we meet outside Parramatta Town Hall for soul winning.